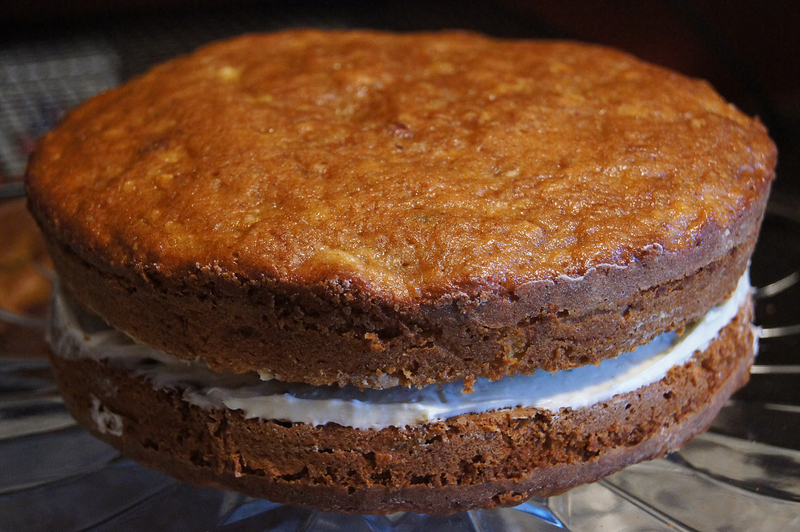 From reading the ingredient list I decided it seemed like a tropical version of a carrot cake. Sounded like a winner to me. 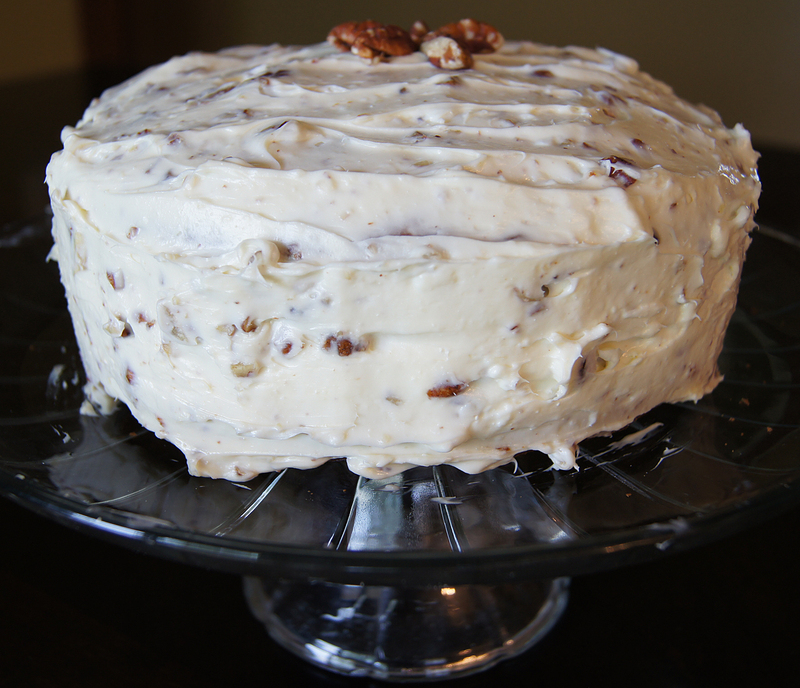 Cinnamon…pineapple…bananas…nuts…CREAM CHEESE FROSTING! Yum. Heading to my mother in law’s for lunch and swimming seemed like a great opportunity to try this new recipe out! I found it on Boulder Locavore. Have you ever heard of “roasting bananas”? I hadn’t either. But the BoulderLocavore did it and raved about the results. So I did it too! 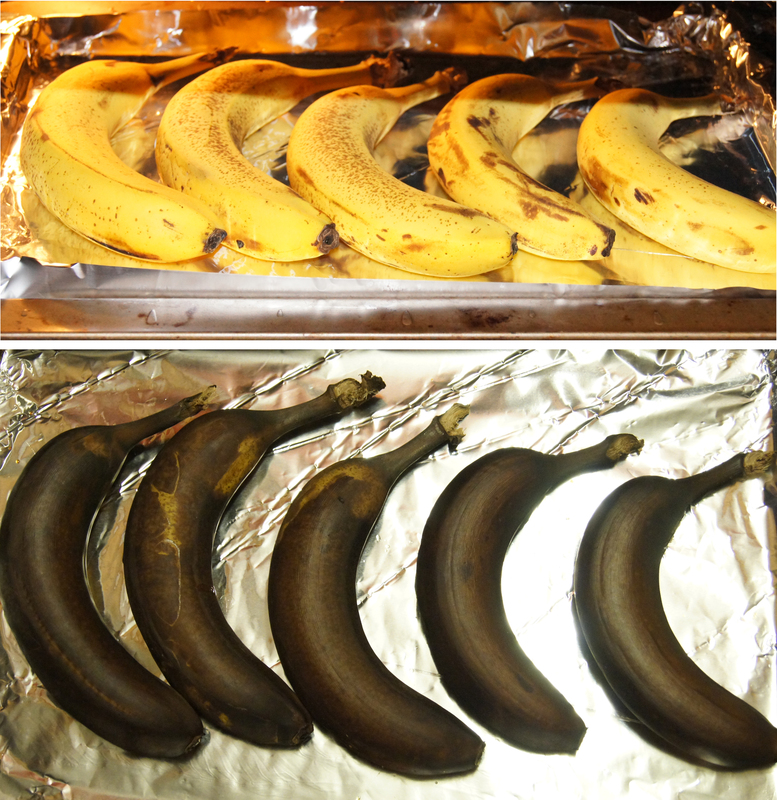 Preheat your oven to 350° (it should still be nice and warm from roasting those bananas) and prepare three 9 inch cake pans. Butter and flour the bottoms and sides. In a large bowl combine the sugar and brown sugar. Add eggs. Stir until smooth. Whisk in the applesauce [or oil] and vanilla. Add the flour mixture all at once. Stir (with a spoon, not a mixer) until the mixture is evenly moist and combined. 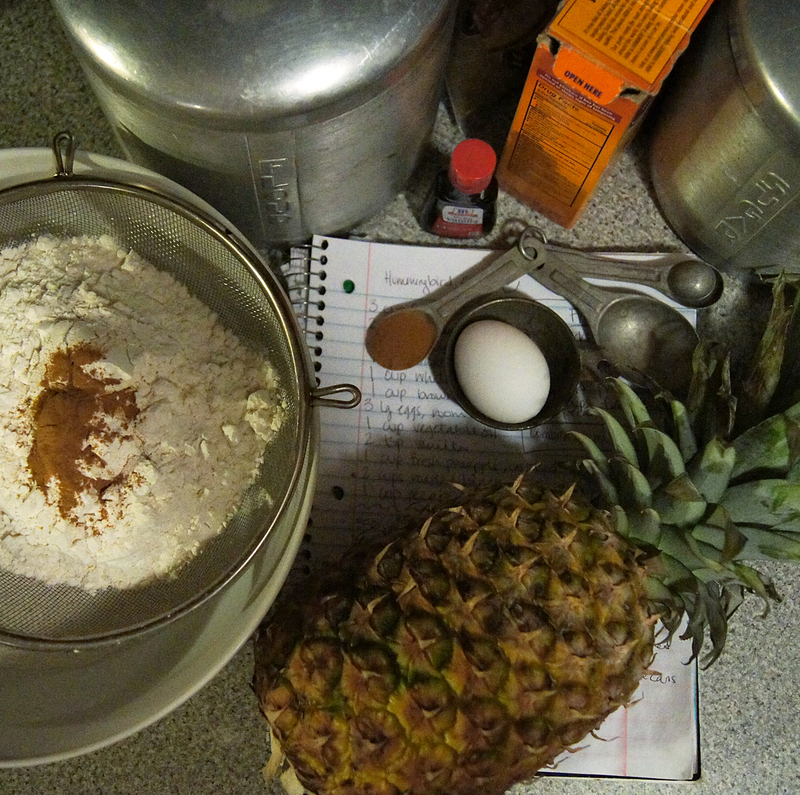 Add the pineapple, bananas, and pecans and stir til blended. Divide the batter evenly among the three prepared pans. Gently bang each pan on the countertop to release some air bubbles. Cool the cake in the pan for 5 minutes. Then pop the cake out of the pan and let rest on a cooling rack. Cut the cool butter into chunks. Beat on low (yes, you can use your mixer now! ), then increase to medium for 3 — 4 minutes. Cut the cream cheese into chunks and add to the whipped butter and continue mixing til smooth. Add vanilla then slowly add the powdered sugar, a little at a time. Continue beating til smooth. Then up the speed and keep mixing for about 3 minutes – or til your frosting is fluffy. Fold in the pecans by hand. You have three layers. (Unlike me, I had two. See that story below, oy!) 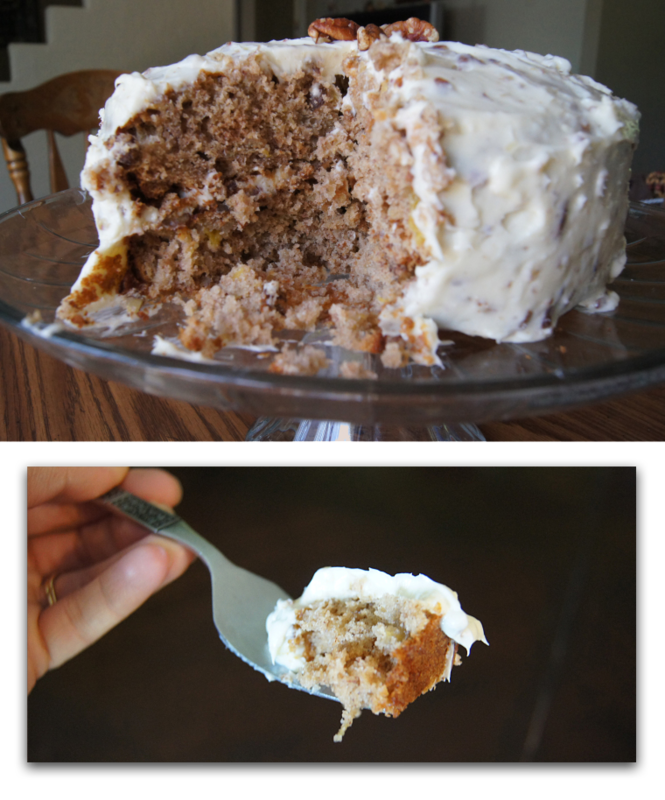 Use about 2/3 cup frosting between each layer. Then use the rest of the frosting to cover the top and sides. Store the frosted cake in refrigerator. Let stand at room temperature for 30 minutes before serving. Makes 12 to 16 servings – slice em thin! As you can see I only have two layers. You should have three. Unless your dog is like mine and enjoys tasting your cake as it cools. Grrrr. So we had one layer at home minus about one piece the size of a deck of cards. 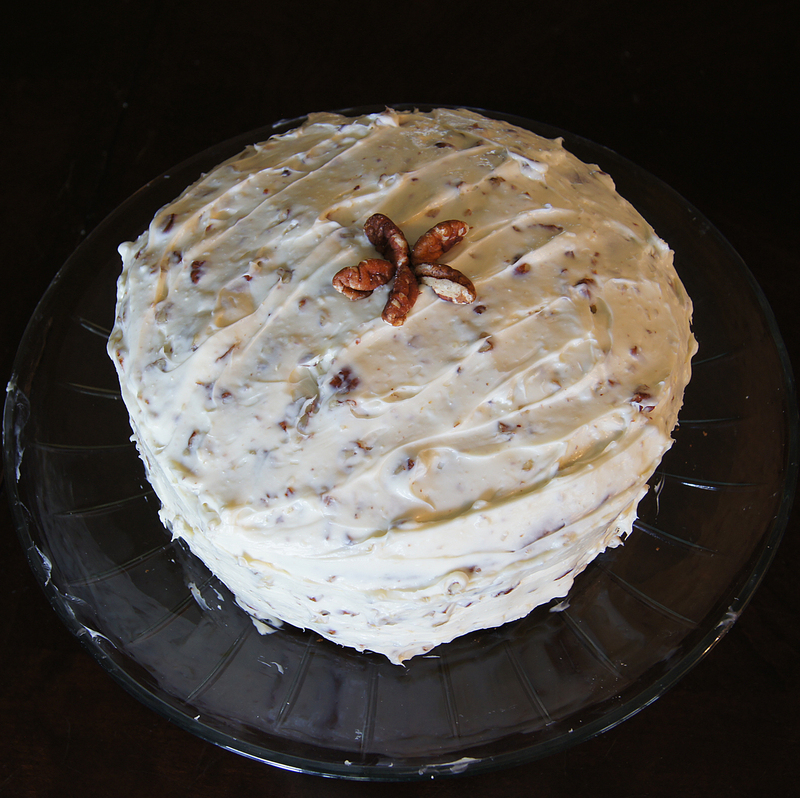 And we had a two layer hummingbird cake. Oh well. Just as pretty and just as yummy. Plus, I’m not sure I could’ve balanced three layers anyway. I’m a cake stacking novice! Maybe my dog is a psychic and was just doing me a favor. Suuuure!